The co-owner of Here Comes The Sun does not enjoy shiny surfaces and you will find few on board his gargantuan new toy – except for the gold discs hanging on the wall of his office. These records, The Beatles’ Let It Be and John Lennon’s Imagine, slip through the net for sentimental reasons: they are they names of his two previous yachts, 47 metre Heesen yacht Let It Be and the 65 metre Amels Limited Editions 212 yacht Imagine (since renamed Infinite Shades). Here Comes The Sun is also named after a Fab Four track, but this a project on an amplified scale. Amels' new flagship measures 83 metres and packs in 2,827 gross tonnes of volume (compare that with 99 metre Madame Gu’s 2,991GT and 95.2 metre Kismet’s 2,700GT). But the combined experience of owner and yard meant that this team knew exactly how to use every inch of the space on board Here Comes The Sun. “Imagine was heavily used. We did 60,000 miles,” says owner’s representative Yavor Nenov, so they learnt what they needed and wanted on board – and what they didn’t. The aspects they wanted to take to the new boat were clearly defined. “Most important for me and my partner was an owner’s private deck and open beach club and a bigger number of guest cabins in order to accommodate our families,” says the co-owner. Nenov used to work as chief steward on Let It Be – and his influence is evident in the design, as a keen interest has clearly been paid to how the crew will circulate and function. 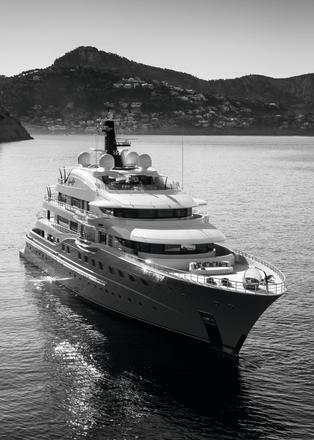 Examples include a crew staircase that runs all the way from the tank deck to the superyacht sundeck, a wealth of pantries, and hidden doors from crew areas into the main lobby on every level of Here Comes The Sun. Amels was also a keen collaborator in this endeavour. “When we asked for some shelving in the bosun’s locker we said it could just be bolted in there,” recalls Nenov. Amels responded that it would go one better than that and measured the shelving to the bosun’s specifications, designed it, welded it and repainted the whole area. In the engine room, Nenov says, “one of the big highlights is space, how the engineers can really work”. The generators have a separate room to contain noise and protect crew in case of emergencies. The integrated bridge, meanwhile, is covered in a glass panel and interfaced so it can be operated by touchscreen; there’s also good visibility and a comfortable seating area for owner and guests. There were upgrades from the previous boats in terms of soundproofing and they doubled the satellite domes to create two identical systems so one could operate even if the other was knocked out by a storm. For example, on Here Comes The Sun, the first Limited Editions 272 (although there are likely to be more to come), Heywood changed the beltline’s angle of descent. “It’s a more gentle curve, swept right the way round the back and into the stairwells and back outside of the stairwells, round the swimming pool.” The superstructure is oyster white, with a muted “castle” tan for the hull. Inside, the co-owner wanted “a calm, beachy atmosphere, light materials and soft colours – a relaxing atmosphere”. Winch responded with a palette of warm browns, cream fabrics, goldtoned lighting, bronze panels with a brushed finish and antiqued patina, and furniture in curving shapes. Rather than glossy, this decorative scheme is tactile, with carved silk and wool carpets, mottled leathers, natural oak panelling and smooth “footworn” floors. The theme of practical solutions, cleverly implemented, is also evident throughout the interior design of Here Comes The Sun; for example, press one of the sections on the smart leather-clad pillars in the main and owner’s saloons and the pillar swings open, revealing a storage cabinet. 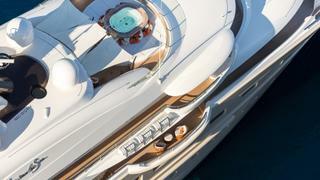 There are plenty more happy surprises on board this yacht. The greatest is perhaps the bridge deck galley (there’s also a bigger main galley on the lower deck), which has a large opening on to the aft deck, where there is a bar and dining table for up to 24. From here guests can speak directly to the chef as he works, make little extra requests to be whipped up in front of them, or decide what they want as they sit down and describe it directly to the chef. “You are basically in a restaurant, upstairs,” says Winch. “The chef is so good that he can do everything simultaneously and there are no service issues, no hot plates issues.” Alongside the galley, also open to the aft deck, is a small “grotto” that could be used as a smoking room or a cosy spot to retire to during inclement weather. 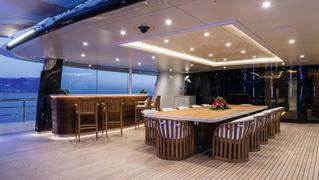 The sundeck above, the perfect place to recover from overindulgence, holds its own surprises. 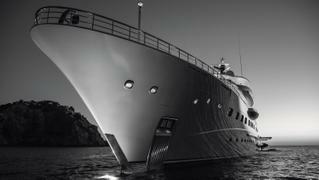 The superstructure to each side sweeps back in long curves, the aft sections of which are shaded glass. Behind these, Heywood has designed individual sunpad nooks, where guests can relax in shade and privacy. 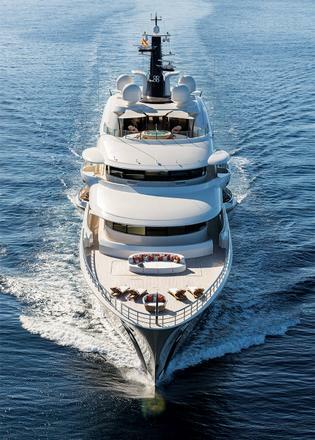 His curving pillars aft – a tricky-to-build Limited Editions signature that Amels produces with skill – add style and have been rigged with lights and to hold awnings that can cover the aft sunbathing space. The covered central portion of the deck holds another long dining table that can be set up for glamorous dinners, while forward there’s a bar and spa pool with sunpads and cabanas. 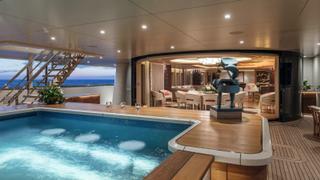 Down on the main deck is another jewel of the exterior spaces, the pool. They wanted to avoid an ungainly ladder set-up that would make it hard to access, or giving it a height that would make the space feel cramped. “We had to modify the superstructure of the yacht, lower the whole pool to drop it down to recess into the ceiling of the beach club without sacrificing the height,” says Nenov. The result is a long, low pool that’s easy to dip into and the superyacht beach club below – something Imagine didn’t have – does not feel compromised. This stylish space includes a central seating area with fold-down platforms to either side and aft of here, beyond a sauna and steam room, there’s an enormous amidships tender garage set up for side launching (this also stores an inflatable slide that runs all the way down from the sundeck, for thrill-seekers with a head for heights). 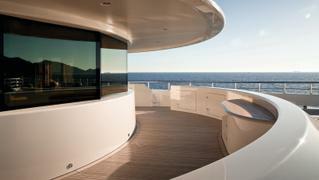 But the owners’ deck is arguably the most spectacular space on board Here Comes The Sun. At the aft end there’s a large lounge with a television that slides seamlessly up from a coffee table, and a broad aft deck and forward of the lobby – a highly individual cabin arrangement. To port is the owner’s wife’s cabin, and, forward, a large mirror-clad dressing room and shower room. 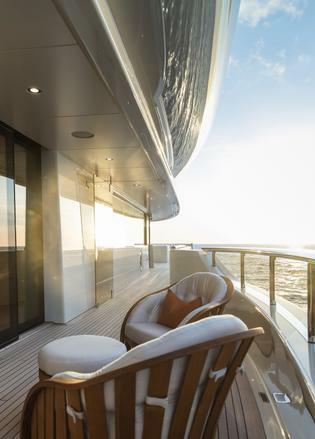 The style is glamorous and feminine, with cream toned fabrics and white marble, but the most exciting feature is the superyacht balcony – accessed via full height glass doors from the cabin. This broad space that curves out from the superstructure feels like an al fresco extension of the interior. 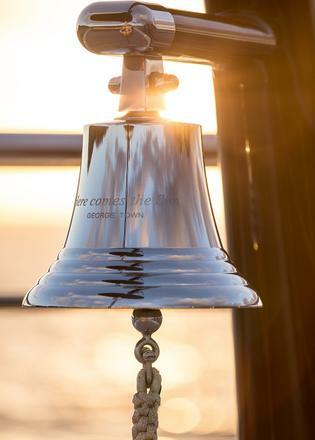 “You can see the whole boat when you are standing here,” says Victor Caminada, marketing manager of Amels. It’s the first time the yard has done this on a Limited Editions but it makes aesthetic sense to the exterior lines as well, echoing the bulge of the wing stations on the deck below. 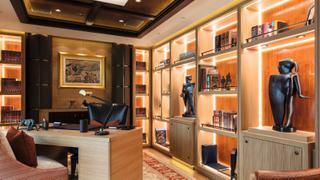 To starboard the owner’s office benefits from a similar balcony set-up, but the tone is warmer, with more natural oak, an eel skin feature wall behind the bookshelves and pony skin on the ceiling. The owner’s cabin forward is accessed via its own corridor to starboard, lined with glass cabinets full of antique silverware and ancient artefacts. 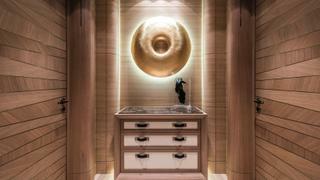 This personal museum runs past a dressing room and shower room – with carved perrera marble walls and a vanity unit in brown maron pinta marble – to the cabin, with its massive central bed and textured, dark wenge back panel. 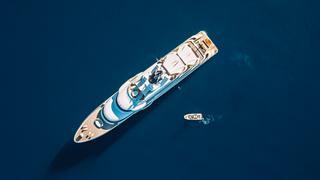 The foredeck conceals a MOB tender and a small crew tender, and can act as a touch and go superyacht helipad, but when not in operation it’s a clean, private-feeling space for the owner. 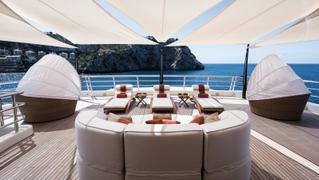 Down on the main deck of Here Comes The Sun, guests have impressive spaces of their own. 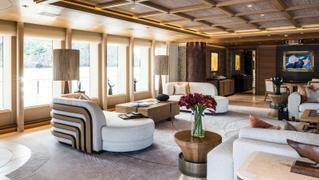 The main saloon comprises, to aft, a circular dining table for 16 with curving full height glass doors to the aft deck, a central seating area with a long bar and a piano forward. Large windows throughout this deck flood the interior with light. Forward of the lobby is a spectacular on-board cinema. The audio system combines a powerful ADA Suite Premium Home Theatre Preamplifier and a Lexicon DD-8 amplifier, plus Sonance speakers. For visuals there’s a full HD 3D JVC beamer with Vutec 123-inch projection screen and an 85-inch Samsung full HD 3D TV. The whole system is controlled by a Crestron system that uses an Apple iPad mini as the user interface. There are five guest cabins on the same corridor, the central two of which have sitting rooms that can be shielded from the cabins by sliding soundproof doors – in this mode the sitting rooms can be converted into cabins, bumping up the total to seven. As the backbone of an unusual general arrangement, Here Comes The Sun’s lobby is a synecdoche of the overall decorative theme. 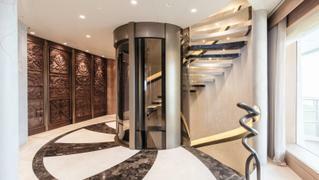 Surrounding the central lift by Dutch company Lift Emotion, monochrome marble stairs wend up from lower deck to sundeck, accompanied by a stone feature wall carved with a vine (the co-owner owns a vineyard). On every level dark, intricately carved walnut panelling from Georgia provides a warm flourish. The effect is glamorous without being flashy – but when you’ve got all this to show off, you don’t need shiny finishes to catch the eye. 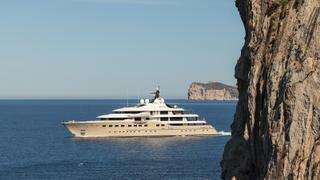 Here Comes The Sun is available to charter with Fraser.